On 23 January 2019, the opposition leader and head of the National Assembly Juan Guaido unilaterally swore himself in as interim president. This followed an internationally co-ordinated campaign to discredit last May’s elections and Nicolas Maduro’s inauguration. The US, Britain, Canada and a host of imperialist lackeys in Latin America have recognised Guaido as the ‘legitimate’ leader of the country, pledging support for a parallel government and calling for military rebellion. They back the forces of extreme reaction, who want to return Venezuela to a petro state at the service of imperialism. Fascist thugs have already taken to the streets, torching cultural centres, public institutions and libraries. British Foreign Secretary Jeremy Hunt’s declaration of support for Guaido is despicable. He regurgitates lies about Venezuela’s internationally-observed electoral process, using the distortions of the bourgeois media as spurious justification: ‘anyone in the UK who thinks that Venezuela is an example, who thinks that we should be adopting the policies supported by the discredited Maduro regime, they need to look at their TV screens and think again’. The British media has played a thoroughly reactionary role in this process, in line with imperialist interests and hostile to any progressive government. Have they forgotten Chile? The so-called ‘liberal’ Guardian and BBC deliberately publish lies and distortions, softening up public opinion for imperialist intervention. There is no coverage of the tens of thousands of poor and working class Venezuelans flooding the streets around the Miraflores presidential palace to defend Maduro and the Venezuelan constitution. Instead, The Guardian has attacked every aspect of the Bolivarian revolution, while remaining silent on the role of foreign intervention and crippling sanctions designed to make the economy scream. With pre-meditated timing, the BBC pushed a story deploring conditions in a Venezuelan prison, priming public opinion for Hunt’s declaration. There will be blood on the hands of these hypocrites. We stand with the Venezuelan working class against the counter-revolutionary and violent manoeuvres of the opposition. The attack on the struggle to build socialism in Venezuela is an attack on the fight against capitalism everywhere. This coup is preceded by years of imperialist interference in Venezuela following the election of socialist leader Hugo Chavez in 1998. This includes the 2002 failed coup, oil lockouts, successive violent street protests, assassination attempts and drone attacks, all funded with millions of dollars each year from shady US and EU organisations like USAID and FRIDE. During last May’s presidential election Henri Falcon, a prominent opposition politician, ran against Maduro and lost by four million votes. After demanding early elections, other opposition leaders boycotted the vote under instruction from the US. In December’s municipal elections the PSUV won 591 of 623 council seats. Meanwhile, the National Assembly – now led by Guaido – has been in contempt of the Supreme Court since 2016 due to a scandal around electoral fraud. Opposition legislators have refused to hold fresh elections over the three contested seats. Just whose commitment to democracy is in question here? The plot was timed to coincide with the anniversary of the 1958 overthrow of military dictator Perez-Jimenez, traditionally celebrated by Chavistas and the left. It was carefully planned weeks before in a high-level meeting between US Secretary of State Mike Pompeo, Organisation of American States (OAS) general-secretary Luis Almagro and members of the reactionary Lima Group of countries including Brazil, Canada, Colombia and Peru. Maduro has severed diplomatic ties with the United States and all countries backing the coup, giving ambassadors 72 hours to leave the country. He declared: ‘Neither coup nor interventionism… Don’t trust the gringo empire. That’s what drives their interest – the desire for Venezuelan oil, gas, and gold.’ Mexico, Bolivia, Nicaragua, Cuba, China, Iran, Turkey and Russia have all reiterated their recognition of Maduro as Venezuela’s legitimate president. Since imposing financial sanctions in 2017, the US has spearheaded the blockade against Venezuela. Switzerland, Britain, the EU, Canada and Panama followed suit with bank account freezes, trade embargos and unilateral measures against international trade payments. These sanctions restrict access to food and medicine, while the Bank of England is currently withholding $1.3bn of Venezuelan gold. Sanctions have cost the Venezuelan economy an estimated $6bn to date, and have blocked access to credit, debt restructuring and investment. As a result, oil production has nosedived to 1.1 million barrels per day, a third of 2008 output. Worse, the measures have blocked the repatriation of over $1bn of profits a year from CITGO, a US subsidiary of Venezuela’s state oil company PDVSA. With the US considering a full oil embargo there is scope for further economic damage to be inflicted. US recognition of Guaido as interim president may now be used to prevent the PSUV government from invoicing payments for oil shipments, while Bolton has indicated that a transitional government could access Venezuelan assets in the US, including CITGO – giving Guaido huge economic power. Urgent internationalist solidarity with Venezuela is needed more than ever. In Britain this has to expose the poisonous coverage by the so-called liberal press, which deliberately promotes a topsy-turvy narrative in which Maduro is unquestioningly painted as a dictator who refuses to accept aid to alleviate the humanitarian disaster brought on by his socialist policies. The Guardian’s Tom Phillips is a particularly vile exponent of the genre. Already exposed for his article ‘Fallen Metropolis’, where he waxed lyrical about the glamour of 1990s Caracas, a haven for ‘foodies, night-owls and art fans’ whilst ignoring IMF austerity measures and the bloody imposition of martial law on the surrounding shanty towns, Phillips continues his propaganda blitz by reporting a collapse of the ‘Barrio Adentro’ partnership that has seen Cuban doctors bring free universal health care to the poorest communities where private doctors refused to set foot. Far from being on its last legs, Barrio Adentro reported over 127 million consultations during 2018. Thousands more Cuban doctors – including 2,500 health specialists kicked out of Brazil by President Bolsanaro – have joined the mission in recent months bringing the total to over 24,000. In December, 22 cooperation projects were agreed between Cuba and Venezuela focusing on health, education and human development. The Ministry of Health has been working closely with the Pan American Health Organisation to distribute medical aid and provide cancer treatments and insulin. A free vaccination plan seeks to prevent up to 14 diseases including measles, diphtheria, tuberculosis, rubella and hepatitis B. Following collaboration with the UN, $9.2m of food and medical aid was agreed in November. While Venezuela’s economic crisis is dramatically affecting provision of health care, lifting sanctions would significantly improve access to medication, and financing for health services. In November 2017, Euroclear, a Belgian-based financial service, froze $1.65bn that Venezuela had paid for food and medicine. The same month Citibank refused to process funds for a shipment of 300,000 doses of insulin, leaving the cargo held up in an international port. Last May the blockade stopped the importation of $7m of dialysis equipment. Any genuine humanitarian concerns around health care in Venezuela must denounce these injustices. Instead, Phillips’ articles are filled with quotes from gleeful opposition activists on rallies in Mexico and Colombia, parroting imperialist lies to support an overthrow of Venezuela and Nicaragua alike. Shamefully, The Guardian reports only ‘several hundred’ turned out for the 23 January pro-government march, yet photos clearly show tens of thousands of red-clad Chavistas thronging the streets in a mega-march that converged from three assembly points across Caracas. Editorial handwringing over potential civil war provides no cover for The Guardian’s role in preparing the coup. For years it has painted Venezuela as a dictatorship and decried a humanitarian crisis requiring intervention. It marches in step with the US, EU and the Lima Group, which aim to overthrow the socialist government by any means necessary. Military support is crucial. Hugo Chavez, a former officer, was famous for instilling revolutionary patriotism in the Venezuelan armed forces. Indeed it was middle-ranking soldiers who rebelled against the 2002 coup government of Pedro Carmona, releasing Chavez from detention and bringing the 48-hour counter-revolution crashing down. Soldiers have regularly contributed to the Bolivarian revolution’s social programmes and the Bolivarian Armed Forces (FANB) now administer several state enterprises. Guaido has promised amnesty and ‘all guarantees necessary’ for any military figures who swap sides. A short-lived rebellion by a handful of low-ranking soldiers in Caracas was quickly stifled with 27 arrests. FANB high commander Remigio Ceballos and Defence Minister, General Vladimir Padrino, have declared unswerving loyalty to the Maduro government and the constitution. In addition 1.6 million volunteers signed up in armed Bolivarian militias have pledged their allegiance to Chavez, Maduro and the Bolivarian project. For now, the civic-military alliance central to the Bolivarian revolutionary movement remains intact. As we go to press, violent street protests have resumed, with armed groups detonating explosives, attacking public buildings and setting up burning barricades. At least 14 have so far been killed in the clashes including Cohen German, a Chavista from Merida who was shot dead and burned by a masked gang. In contrast to the violent ‘Guarimba’ protests of 2014 and 2017, confined to wealthy districts and shopping centres, this time the opposition are sending their supporters to working class neighbourhoods, generating chaos to project the image of a popular rebellion. The coming days will be crucial. Trump has toyed with the threat of military invasion since becoming president. Now he once again declares ‘all options are on the table’. 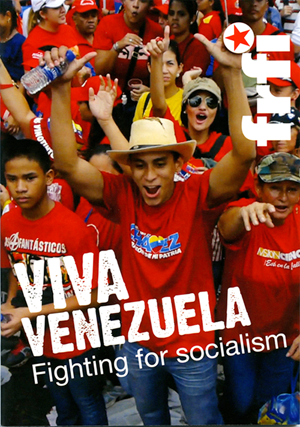 Venezuela is on the frontline of the fight for socialism in Latin America, a massive class struggle which has seen Chavista governments channel oil wealth into social programmes: universal free health care, education, 2.5 million units of social housing, systems of participatory democracy and cooperative production, communal councils and communes. Despite these gains, the commanding levels of the economy remain in private hands and the PSUV government is now under immense pressure from hyperinflation, strangling sanctions, foreign intervention and fascist violence. In the face of this imperialist intervention the working class and poor, the workers in the state industries, the campesinos and communal activists continue to support Maduro. They remember what happened in Chile in 1973. They know the alternative is a return to the neoliberalism and repression of the 1980s and the Bolivarian revolution drowned in blood. We denounce the media war and economic blockade. We oppose any attempt to interfere in sovereign states and call on all progressive forces to do the same. Hands off Venezuela! No coup! No intervention! End sanctions now!